1. Steve Madden platform sandals with that stretchy vamp. 2. John Fluevog's "Munster" shoe. Why entrusting your feet into the care of someone named "Fluevog" is beyond me. 4. Clomp-clomp. Folks heard you coming from miles. 5. Leopard platform sandals. Did you also use those furry pens? You did, didn't you? 6. Sketchers: the worst. SO UGLYYYYAHAHHAHAHAFKDHJWLKDJF:WLEJFOW:EFIJWOEIJ. 7. Adidas unisex sport sandals. If you were a cool boy, you'd wear them with socks. All through the winter. 13. Airwalk made these shiny sneaks, and the red ones had hologram sparkles in them. 15. Foam footwear. Never shoulda happened. 17. Remember these Chinese-inspired Mary Janes that offered guaranteed pain thanks to no arch support? 18. Jelly high heels. Awesome at the time. Kind of embarrassing when they made a "comeback." Please no more comebacks. 19. Nike split-toe sneakers. For all those edgy weirdos. 21. Keds. A standard. Except did you ever wear two different ones on each foot? You did? Oooh, you rebel. 22. 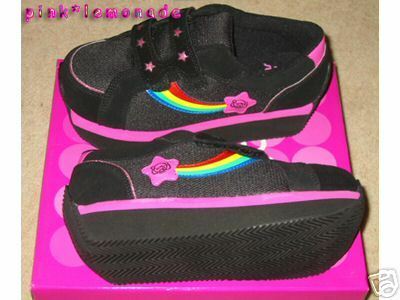 And last...technically Heelys debuted in 2000. But this was a terrible footnote on which to end the decade.